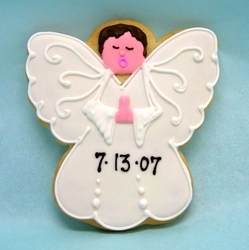 These adorable Angel Cookie Favors taste even better than they look! Cookie Favors are a delicious and fun way to celebrate your child's Christening, Baptism or First Holy Communion. Each custom cookie favor comes in cellophane bag and curling ribbon. Each cookie favor can have the date of event written right on them, for a truly custom cookie party favor. Trendy, fun and affordable, our personalized angel cookie favors are sure to be loved by all! Ingredients for angel cookies: flour, sugar, butter, eggs, vanilla, almond extract, baking powder and salt. Ingredients for icing: Powdered sugar, meringue powder, gum Arabic, and cream of tarter. NO PRESERVATIVES!